Another mysterious discovery by archaeologists i would really love to dive into is The Peruvian skulls found in Florida. January 2012, during an excavation for a South Florida swimming pool by a plumber revealed two hideous looking skulls in the backyard which sparked questions of intrigue and murder but now researchers say that the origin of these bones are even more of a mystery than they initially thought. 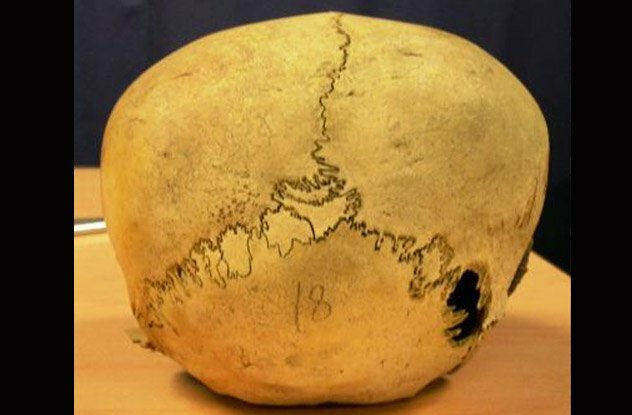 The two skulls was that of an Old man and a 10-year-old, which still had skin tissues on it after police investigations it was concluded that it wasn't just a normal murder crime or wasn't even a murder crime at all. According to Medical Researcher, Jan Garavaglia she said the bones had a feature of 'Inca bones' a telltale sign of a human from the Incan culture of Peru. Research made out that the bones had a lengthier history of 30 years or more since it was found in Florida but examinations by the Medical Examiner's office revealed that the bones were atleast hundreds of years old judging by the mummified pieces of skin on the skulls. Jan Garavaglia said that the florida yard was obviously a secondary burial site. What researchers cannot figure out and Garavaglia says they probably will not be able to figure out is how the skulls ended up in Florida. Dating back to 1030s and 1920s tourists on vacations may have bought them before laws regulated the trades of such artifacts but its no longer allowed. Another plausible reason, is that migrant workers from Peru may have brought them as a connection to their ancient heritage and decided to have moved on then they bury it either way, it's still very unclear if it was a murder back then, how bones dating back to 800 years ago had items of the early 90s buried with it and most importantly, how it ended up in a Floridian home back yard.